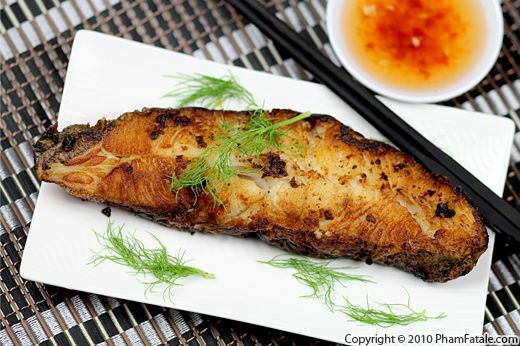 Turbot fish is a flat, bright white-fleshed fish that is well-known in both French and Asian cuisine. The flavor is quite delicate and is perfect if you're looking for a light meal. I dredged the fish in a little flour and pan-fried it until the surface is slightly crispy. The only trick to preparing turbot is to carefully watch the cooking time. You don’t want the fish to be too dry and over-cooked. I decided to serve it with fish sauce. You could also accompany the fish with spicy Indian-style salsa (called kachumbar) or a French sauce I often love to pair with fish, called sauce au raifort (horseradish); I will post this recipe soon. Ask your fishmonger to prep 6 nice turbot steaks. Wash and pat dry using paper towels. Place the fish steaks in a small, shallow dish. Season with salt, cayenne pepper and 1 clove of crushed garlic. Make sure the spices coat the fish. Spread a tablespoon of oil evenly in the dish. Marinate the fish for no more than 30 minutes. Pat dry the fish one more time. Using a fine mesh strainer, sprinkle some flour over the fish steak and shake off the excess flour. In a skillet, heat the oil and fry the garlic cloves until golden. Remove the garlic and set aside. Once the oil has a nice garlic flavor, add the butter over medium heat. Gently shake the excess flour off each piece of fish steak one more time. Place the fish in the oil, making sure the fish steaks don't touch each other. Jiggle the pan to make sure the fish does not stick to the bottom of the pan and is totally coated with oil. Cook until lightly golden for about 2-3 minutes (depending on the thickness of the steak), flip each piece (I use chopsticks which I find easier to maneuver; you could use a slotted fish turner) and pan-fry the other side for another 2-3 minutes until crispy, lightly browned. Jiggle the pan again. Place the fish sticks on a paper towel. To check the "doneness", gently press the fish steak with your finger; it should feel springy in texture or you could also cut one fish steak in two. The color of the meat should be white and opaque. If it's still clear to translucent, put it back in the oil. 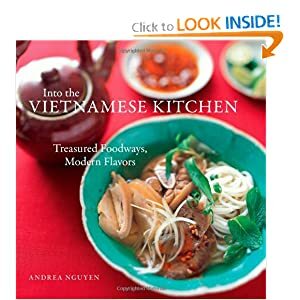 Serve warm with sautéed greens and nước mắm dipping sauce on the side. If you can't find turbot fish, you can make the same recipe cooking with halibut, sole or flounder. Dredging the turbot in flour keeps the moisture in and makes a golden outer crust. Once you add the flour, pan-sear the fish steaks immediately. If you wait too long, the moisture from the fish will become glue-ey and soggy.